Fat Quarter Shop's Jolly Jabber: Layer Cake Checkmate: Free Pattern with Video Tutorial by Fat Quarter Shop! 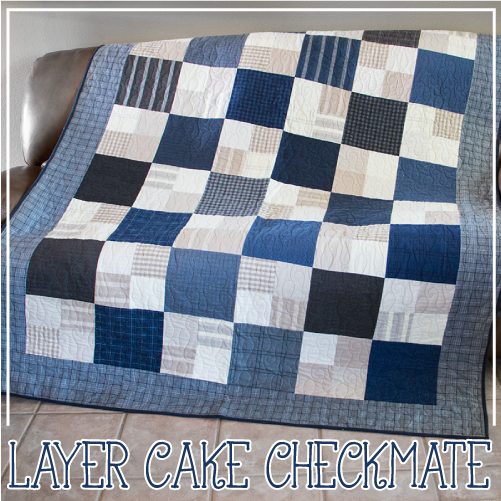 Layer Cake Checkmate: Free Pattern with Video Tutorial by Fat Quarter Shop! Have you noticed that we love sharing FREE PATTERNS with you? It's true - we do! We're sweet that way, and are pleased to kick off August with another free pattern for a Shortcut Quilt. 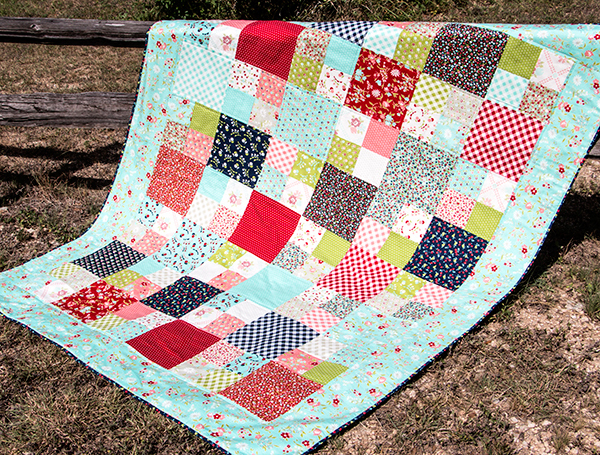 This new quilt is called Layer Cake Checkmate, and it's easy, quick and fun to stitch up. It's sew simple that even a beginner quilter can turn out an awesome and snuggly quilt, especially when you use our Layer Cake Checkmate Quilt Kit! We're switching things up and made a "manly" quilt that would do any Man Cave or guy's dorm room proud! The featured quilt was made with flannel, so it's super soft and snuggly. While that may not sound so great during these hot summer months, this quilt will be a coveted cover when the chill of fall and winter set in! Wasn't that easy? Now it's time to select your fabric! If you'd like to make the same quilt shown in the video, you can find the aforementioned Layer Cake Checkmate Quilt Kit here! We also have a coordinating Backing Set! We know you're going to love these Wool and Needle IV Flannels by Primitive Gatherings for Moda - they're SO soft! If you opt to make your quilt with Layer Cakes versus a Kit, we've got a sale for you! Offer ends at midnight CST today, August 3rd - so don't delay! Variety is the spice of life, so we stitched up a version of this pattern in quilter's cotton, shown below, so you can see the Checkmate Pattern in a lighter and brighter fabric. One great pattern yields so many great options! You'll also see different versions of our Checkmate quilt that some of our Quilter Blogger Friends have stitched up, so don't miss the links out to their Checkmate quilts further down in the post. They had a lot of fun with this pattern, too! This version of the Checkmate quilt, made with Vintage Picnic Layer Cakes and yardage by Bonnie & Camille for Moda Fabrics shows that the Layer Cake Checkmate Quilt stitches up beautifully, no matter the fabric types or colors. 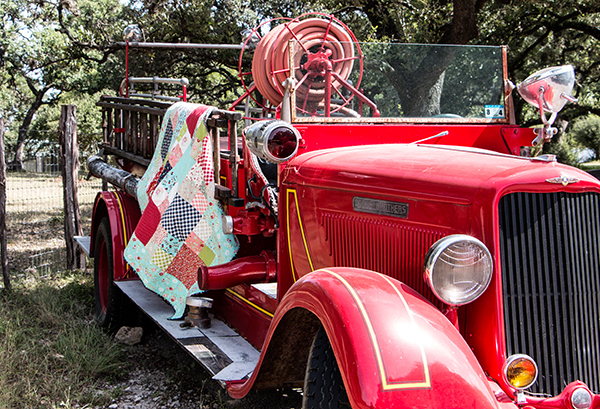 And isn't that vintage fire truck the cutest? We asked some of our favorite quilter bloggers to play along and sew for our Checkmate quilt, and they did - sew fun! Please visit each of these blogs to see which fabrics each of these super quilters used on their Layer Cake Checkmate Quilts! We hope you enjoy sewing, and cuddling up under, this Layer Cake Checkmate Quilt!